In this paper, we consider the following variant of the geometric Steiner tree problem. Every point u which is not included in the tree costs a penalty of π(u) units. Furthermore, every Steiner point we use costs c S units. The goal is to minimize the total length of the tree plus the penalties. We prove that the problem admits a polynomial time approximation scheme, if the points lie in the plane. Our PTAS uses a new technique which allows us to bypass major requirements of Arora’s framework for approximation schemes for geometric optimization problems . It may thus open new possibilities to find approximation schemes for geometric optimization problems that have a complicated topology. 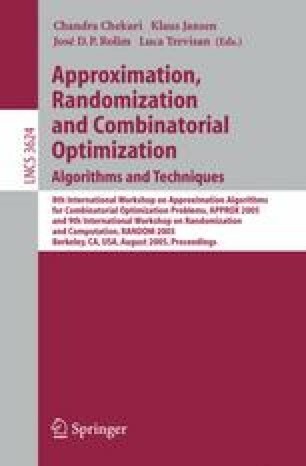 Furthermore the techniques we use provide a more general framework which can be applied to geometric optimization problems with more complex objective functions.